Have you been injured in a car accident in El Dorado Hills? Was a loved one injured or killed? A local El Dorado Hills car accident attorney can ensure you receive the representation necessary to get just compensation for your injuries and loss. Call El Dorado Hills car accident attorneys Adams & Corzine. Give yourself the benefit of working with an attorney with over 35 years of combined experience winning personal injury car accident cases. Get a tough and experienced local car accident attorney on your side. Our experienced car accident lawyers will negotiate with insurance companies for you, help you navigate the complex local court system, and get you the compensation you deserve for the losses you suffered in El Dorado Hills in a car accident. We’ll help guide you from our free consultation phone call all the way to getting a fair compensation check in your hands. And we’ll do it all with compassion and personal attention. After an El Dorado Hills car accident, you or your loved one’s physical and financial well being could be in jeopardy. Don’t face the complex and emotional process alone. Contact us to speack with an El Dorado Hilsl car accident lawyer with over 35 years experience. Insurance companies might contact you. They could offer you unfair settlements or try to give you advice that’s in their best interest—not yours. Without expert guidance, you could make a decision that will cost you a lot of money. But as our client, you’re in good hands. Our experienced car accident attorneys will negotiate with the insurance companies for you to attain compensation for your El Dorado Hills car accident. Don’t leave your well being or your family’s—to chance. Speak with one of our experienced El Dorado Hills car accident attorneys today. As leading El Dorado Hills Car Accidents Attorneys, we know from experience how traumatic and stressful this time can be. You don’t need legal hassles in addition to the physical and emotional toll of an auto accident in El Dorado Hills. You need a tough, aggressive advocate. We’ll provide you with solid legal advice, but we’ll also give you the personal attention you deserve. You can always count on us to be respectful and compassionate. A car accident is a painful enough experience, especially when aggressive insurance companies, and other drivers, are involved. El Dorado Hills is located in El Dorado County in northern California. 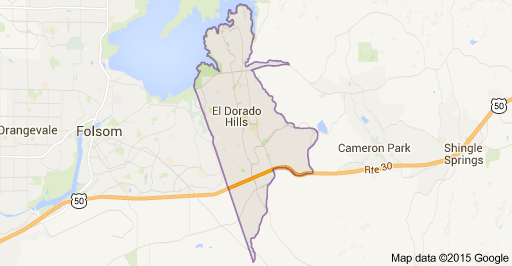 El Dorado Hills is north east from Sacramento, East from Folsom, Granite Bay, and Roseville. El Dorado Hills is near Folsom Lake which allows residents to enjoy water sports during the summer months. Most of El Dorado Hills is comprised of farm and ranch land, but has many communities, especially built around golf courses, and many opportunities for outdoor recreation. Many of the residences in present El Dorado Hills have come from Sacramento or the Bay Area after retirement. The boom of new El Dorado Hills residents in the 1990s prompted a new town center to be constructed. The new El Dorado Hills Town Center is located just south of Highway 50.